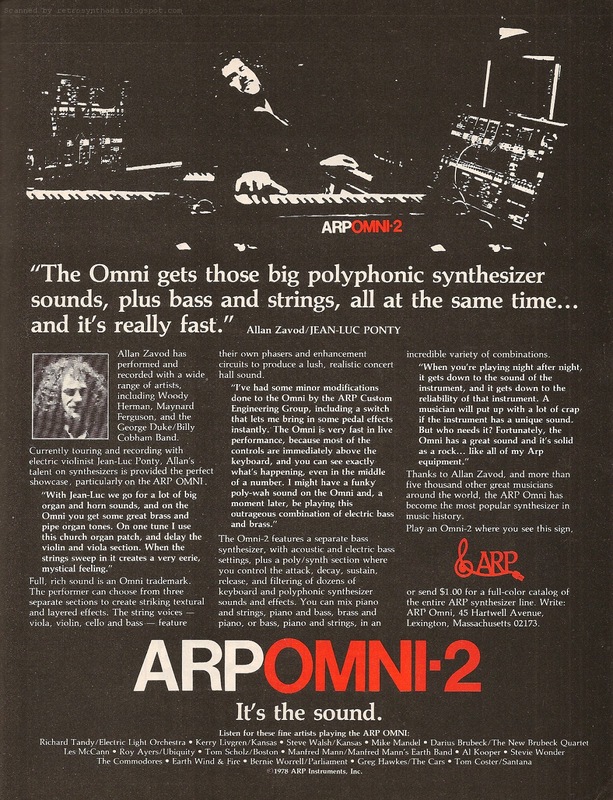 ARP Omni-2 "Big polyphonic synthesizer sounds.../Allan Zavod" black and white and orange full page advertisement from page 41 in the September 1978 issue of Contemporary Keyboard Magazine. Halloween is getting closer and closer, and I think I'm finally getting into the spirit. Pumpkin is ready to be carved and boxes of candy have been bought. Even more surprisingly, I still haven't opened any of that candy stash. Usually I'd be on box #2 by now. That *is* a first. But there is still three nights to go. Let's not get too optimistic. My insulin levels are already rising in anticipation of a will-power breakdown. 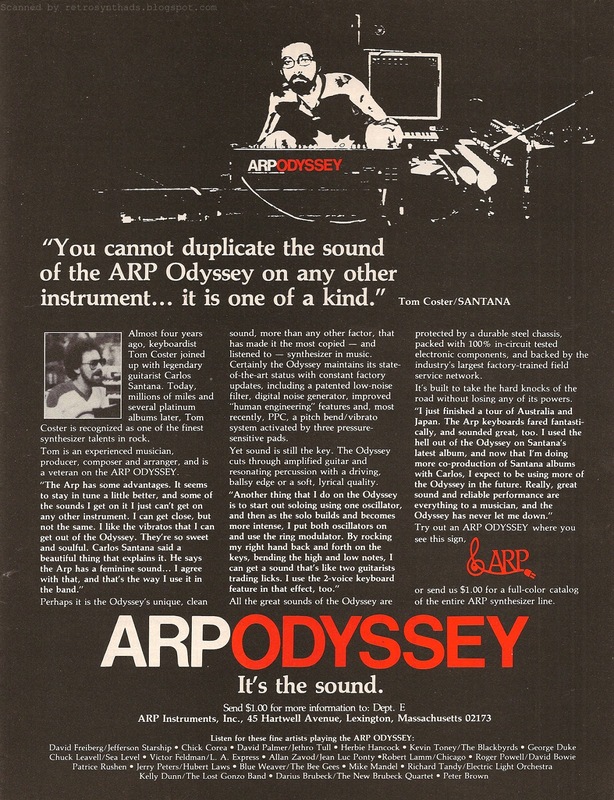 The first ARP ad that used the new colours was an Odyssey advertisement that featured Tom Coster of Santana fame. The following month, ARP decided to give the same kind of make-over to their Omni-2 ads. And readers of Keyboard would have had the opportunity to come across both of these ads in the September and October 1978 issues of Keyboard. Nice. The more I look at these ads, the more I like 'em (could be all the talk of sugar too). Now, if like me you found Coster had a spooky jack-o-lantern kinda look to him in that Odyssey ad, you may also have found that Allan Zavod superficially resembled a very happy Frankenstein in this Omni-2 ad. I'd be a very happy looking person too if I was surrounded not just by Omnis, but those other ARP synths as well. Look to be 2600s to me. I don't have 2600s surrounding me at the moment (I haven't checked my lotto ticket yet), but thanks to Allan Zavod and this ad, I am still quite happy because of all this ad-copy. Well, actually, just that last paragraph. "Thanks to Allan Zavod, and more than five thousand other great musicians around the world, the ARP Omni has become the most popular synthesizer in music history..."
Unless you are Apple Computers or Nintendo and your quarterly earnings are through the roof, its often quite hard to get a company to cough up real production numbers. Usually companies will try and keep those numbers confidential for as long as possible. So, after almost a year of ARP bragging that more Omni's have been sold than any other synthesizer, we finally have a number from ARP (over 5000) to back up that claim. 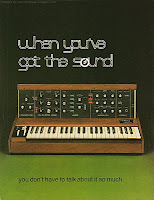 5000 doesn't seem like a lot now, but back in 1978 synths were still falling slowly towards affordability. But it wouldn't be long after that new technologies would make both the power of synths skyrocket while bringing prices to the lowest they have ever been. The result? 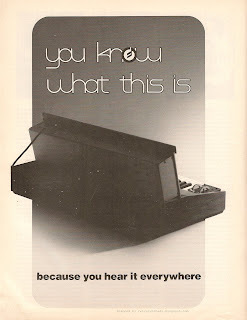 Well, after the DX7 was released approximately four years after this ad appeared in CK, it apparently sold over 160,000 units according to Wikipedia. The M1 came out in 1988 and sold 250,000 units. Interestingly, each of these machines sold for $2,000 - more or less. Of course, you have to take into account inflation. One online inflation calculator tells me that $2000 in 1978 had the same buying power as $3,143.32 in 1983 and $3,717 in 1988. So, costs down, but technology in those machines definitely skyrocketing. If only I could same for the Halloween mini Mars and Snickers bars where although prices for a box of 90 seem to go down every year, so is the size of the little bars in each little package. I have to eat something like ten now just to get a full chocolate bar fix. Or at least it seems like it. 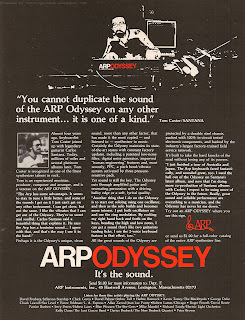 ARP Odyssey "You cannot duplicate the sound of the ARP Odyssey..." black and white and orange full page advertisement from page 41 in the August 1978 issue of Contemporary Keyboard. Oooooh - Halloween is approaching and I think I'm finally getting into the spirit of the season. My gothy/industrial-influenced teen-age years give me a natural affinity for skulls. Even earlier, as a child, a glowing skull is one of the few things I brought back from Disney. No mouse ears for this young pirate. If you haven't seen the trend yet in these blog posts as of late, ARP has also been approaching full-on Halloween-ess in their ads. And so here we have ARP going full-on jack-o-lantern in this new Odyssey advertisement. It makes sense that this ad first appeared in the August 1978 issue of CK and then continued to run monthly through September and into spooky October as well. 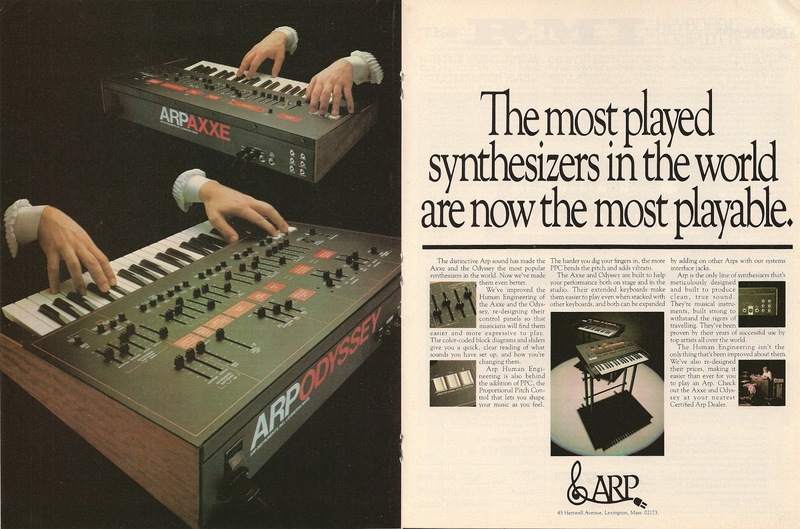 I really like that the designer of the ad took the next logical next step and incorporated the new synthesizer panel colour scheme ARP first introduced on their gear last March into the actual ad itself. And speaking of spooky, doesn't Tom Coster look just a little bit spooky in that black and white ad photo. I'm not saying I don't like that image. Its actually quite awesome because if you look closely, I'm pretty sure that's a maple leaf on Tom Coster's shirt. Go Canada! In fact, it kinda looks like an NHL Maple Leafs jersey, no? But, if Google images is any indication, it doesn't really look like a 1978-style jersey. Not really a hockey fan anyways. But still get a kick out of the idea. I checked his Wikipedia page and did a few quick Google searches to see if I could confirm he is/was a hockey fan, but nothing came up. But Wikipedia does tell me he was born in the hockey-town of Detroit (although raised in San Francisco). Like the ad in Monday's ARP post, this ad has a lot of text running across the page. But this time at least a large portion of it is quotes from Tom - makes the ad more personal. And, this time the ad copy isn't running all over the imagery. 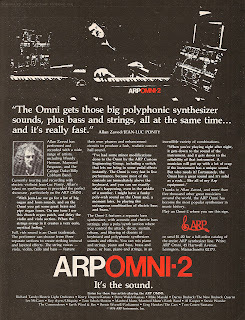 Let's face it, that last ARP Omni-2 ad was a bit of a dog's breakfast. For comparison, I've put them side by side above. We still have a lot happening in this new Odyssey ad, but just that little bit of extra white space (er.... black space) makes it a much more visually balanced ad. The eye has places to focus on. Even the ad-title at the bottom of the page that is in such close proximity to the ad-copy looks good. 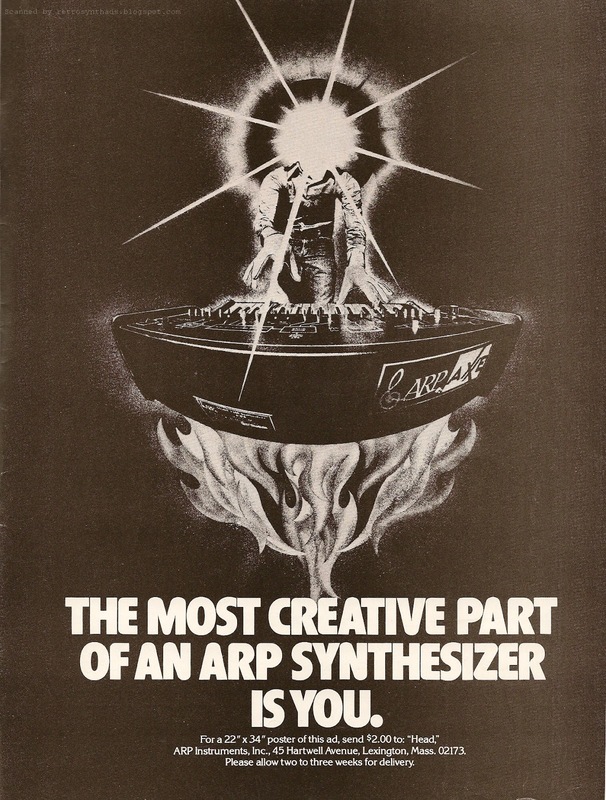 And those oange accents on the name of the synth and the ARP logo also give this ad a nice kick. So, yeah... ad itself, less spooky on the readability front. More spooky on the Halloween front. ARP Omni-2 "...into a rock and roll orchestra" full page colour introductory advertisement from page 50 in the March 1978 issue of Contemporary Keyboard. My mom always said that if I had nothing good to say, don't say anything at all. Well, I'll keep this post short then. ARP has a history of wordy advertisements. Four or more paragraphs is not uncommon, such as in the ads below. But usually the words in those ads are at least readible. Dark text on a light background. Or the other way around. 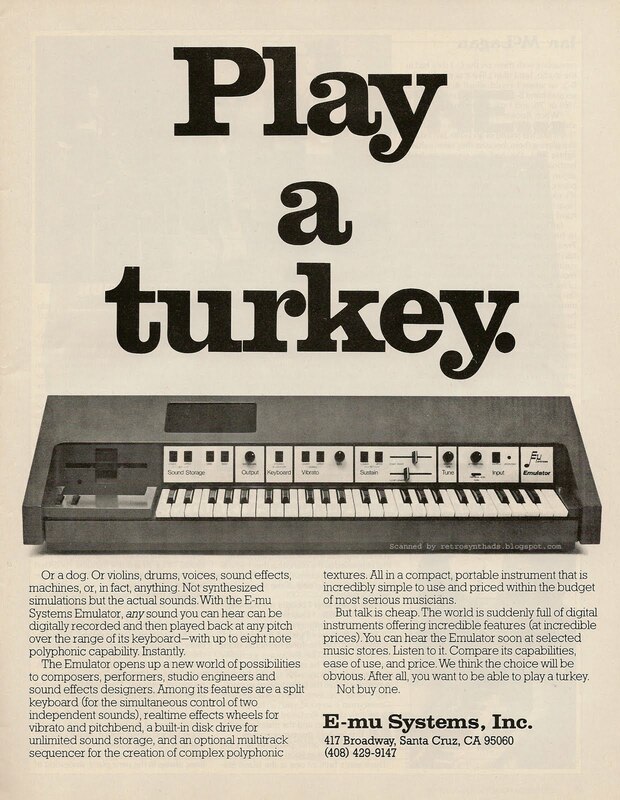 But when I look at this Omni-2 ad, my eyes just don't know where to start. The title is large, but the main image is too close underneath it. Copy is running over the images. And the image of the Omni-2 is bumped up against the ad-copy as well. This is a good example of what happens when there isn't enough "white space" in an ad. In fact, this ad reminds me of what I get back from a passive aggressive designer after I've given them too much text and too many images to use in an ad. Rather than just trying to explain there is just too much crap to include, they make the point by providing a first draft with all that text and images intentionally running all over each other. 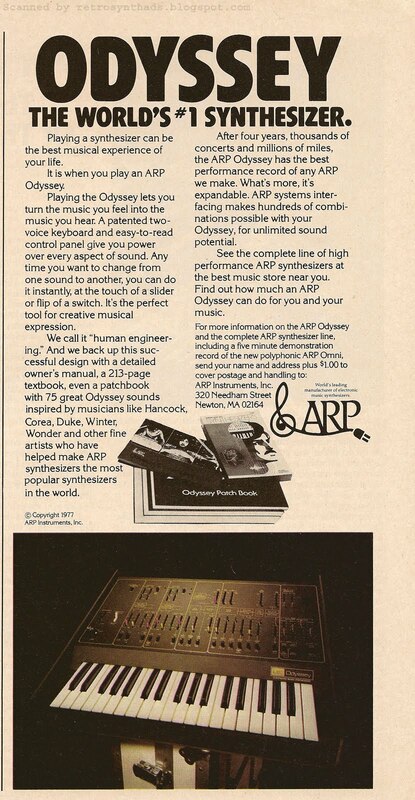 I can understand ARP's need to make sure this Omni-2 introductory ad provides as much information as possible to the readers of CK, but I'm pretty sure that even I could cut that ad-copy in half and still get all those messages across. The first message in this ad is the one I'm most curious about. It references the ARP String Ensemble as it's direct evolutionary predecessor, although I'd have thought that position would have gone to the original Omni (Omni-1...?). 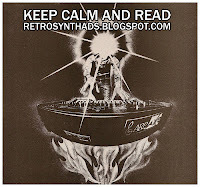 In fact, the original Omni had it's last ad in CK running almost right up to the launch of this Omni-2 ad. 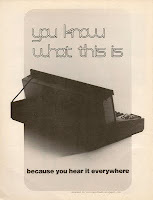 And it was promoting it as the "best selling synthesizer in music". So, why wouldn't ARP leverage the original Omni's clout in this respect? 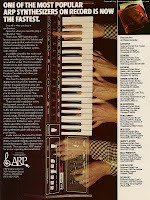 "ARP later released the Omni Mk 2 (pictured above). It was basically the same machine as its predecessor, except for a few minor enhancements and a cosmetic Orange & Black color-scheme upgrade." The Omni Wikipedia page provides a bit more detail on these changes, but basically it was the same machine except with the new "Halloween" colour scheme. So, comparing it back to the String Ensemble with its lovely string sounds probably makes sense. Interestingly, this wasn't the only new ARP ad to appear in CK this month. 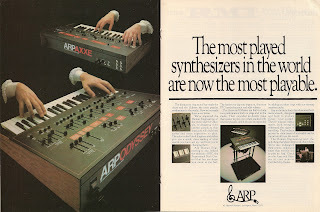 There was also the ARP Odyssey and Axxe "...now the most playable" two page ad that began running - introducing the new colour scheme with those two synths. Aaaaah - so really, all three machines were being re-introduced with the new colour scheme in the same month, but the Omni also had a few tweaks to it, so made sense to create its own ad rather than group it in with the other two. The other half of the ad-copy can be split up into two basic themes. Technical - polyphonic, connectors, etc; and ARP's favorite topic - Human Engineering. On the technical front, the Wikipedia page mentions that the bass section of the Omni-2 had its own audio output, giving the keyboard three audio outputs that ARP would refer to "Tri-phonic" in literature. But this early ad didn't include that little marketing gem, suggesting that this term came later in the Omni-2's life time. And those ARP writers transition from technical to Human Engineering nicely by mentioning that Omni-2's variable control panel has the new graphic colours and thus "like other Arps... are faster to read and understand for better live performance". Okay, so, this ad isn't all bad. But unlike books, I do judge ads by their covers. And, I probably should have done what my mom said and kept my mouth shut. 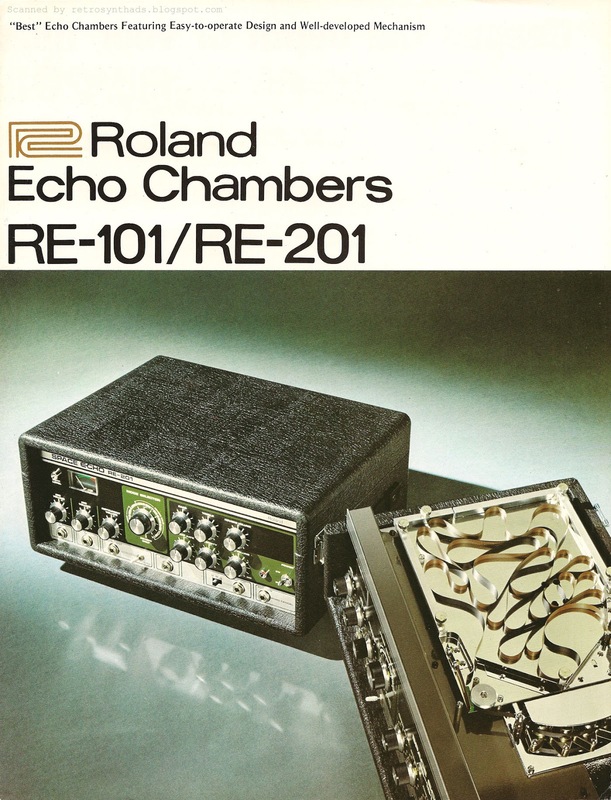 Roland Echo Chambers RE-101/RE-201 "Deepen the Depth of Your Music" four page colour brochure from 1975. When I first got this brochure, I looked at the front image and asked myself.... REALLY? The tape inside these things really just flops around like that? Just all curled up? Can someone verify that for me? Or am I missing something? I just find it hard to believe, but then again, I find it hard to believe I used to listen to music on magnetic tapes at all. Or read books made of paper. Paper, I tell ya! No matter - this brochure rocks. Yeah, its not a retro synth. So what. This thing is aces. 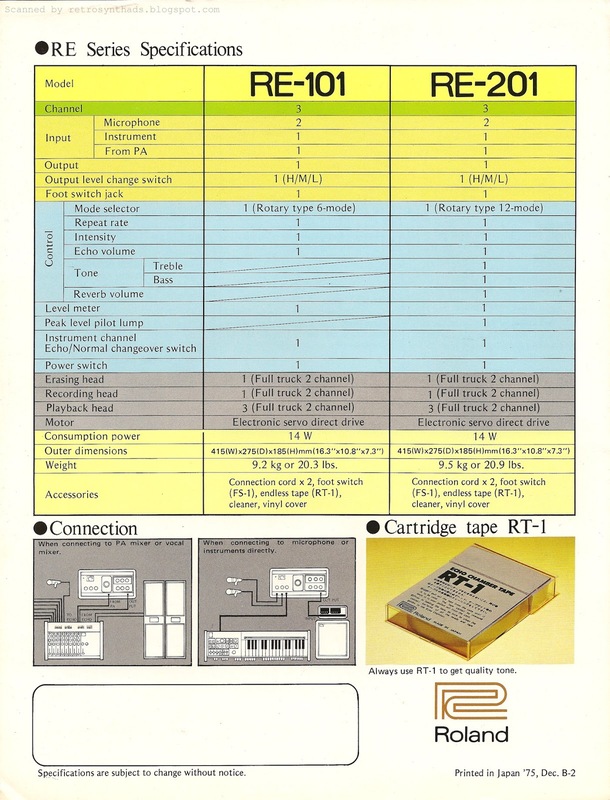 Before looking at this brochure, I really had no idea how tape delays functioned. Or their features. Nothing. I guess I could have always looked on the Web, but just never had the inclination. And that's too bad, 'cause now that I've read this brochure, I'm going on the hunt to find one. Or three. It's just the kind of doo-hickey I love. It has lots of knobs and controls and it's made to be opened up and fiddled with. Yum. The brochure's title "Deepen the depth of your music" is awesome, so it's beyond me why its located on the inside pages rather than slapped on the front - it would only add to the cover's beauty. Instead, the top of that front cover has the rather awkward lonely text "Best Echo Chambers Featuring Easy-to-operate Design and Well-developed Mecanism" just kinda floating there. No matter, because once that brochure is opened up, it's like entering the Land of Oz. 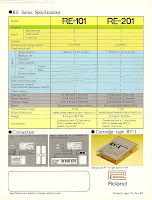 Smaller photos of the RE-101 and RE-201are surrounded by labels describing all the features of each and every switch, knob and dial. And if you hate diagrams with labels randomly scattered about the two-page spread, then flip to the back for a nice little table comparing the main features of the two units. And, for those history buffs, they graciously printed the full date of the printing - December 1975. Excellent. Not much else to say today really. I've been kinda quiet both online and off recently. Except that while doing research, I noticed a couple of things that I found interesting. 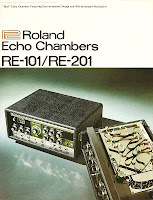 First, the name of the RE-201 - the Space Echo. Although this awesomely cool name is clearly visible on the front panel of the 201 in the brochure photos, no where in the actual brochure is it ever referred to as the Space Echo. It's always referred to by the model number. And Space Echo is such a cool name that I think that was a lost opportunity, especially since, according to Wikipedia's RE-201 page, it is what the 201 became commonly referred to by the masses. Listen to the people, people! 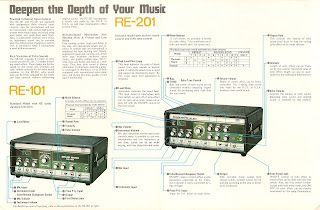 Second, the brochure keeps on bringing up the fact that the reverb unit incorporated into the RE-201 was manufactured in the U.S.A by O.C.E. I've heard the name before, for example, in the Boss RX-100 reverb owner's manual (PDF) where it is referenced as "The three spring OCE Reverb Unit". But, I have no idea who or what exactly O.C.E is. And the few Google searches I did brought up nothing. I hate it when Google searches come up with zip. So... um... anyone got more info on O.C.E.? Email me or leave a comment. Thanx. ARP Odyssey and Axxe "...now the most playable" two-page colour advertisement from page 34 and 35 in the March 1978 issue of Contemporary Keyboard. Halloween is getting close. It's usually around mid-October that I realize just how much I'm falling behind of all the different things I wanted to get done before the end of the year. Music. Work. Catch up with friends. The works. And Halloween was the only theme I could think of when I took a look at those dismembered hands floating over the Odyssey and Axxe on the right half of this two-pager. Hovering hands are one thing, but what really confuses me is the clothing choice. Those white frilly frocks chosen to accentuate the hands in the photo are a little outside their time period. Or was there a Shakespearian resurgence in the late 70s that I'm not aware of? This ad is actually quite significant in the history of ARP. It marked the company's announcement to the world of their new black and orange colour choice for their synthesizers. Vintage Synth Explorer's ARP Odyssey and ARP Axxe pages include some great images of the different colour schemes used for both synths. A good read. The new colour scheme promo wasn't just limited to CK either. Although that magazine seemed to have received the most advertising dollars to get this two-pager into the March, April and May 1978 issues. Plus also appeared in the June issue of CK as a full-colour 1-pager - running just the right-half of the ad. Having that large photo take up the full left-half of the page really does help re-purpose the ad easily as a one-pager. And they did just that when ARP ran the 1-page version on the back outside cover of the May/June 1978 issue of Synapse magazine. 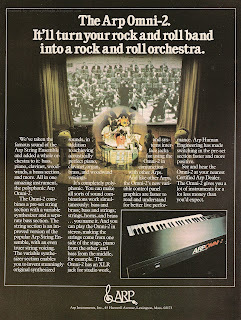 The 1-page version also ran as a black and white ad in the March (UK)/April (International) issue of International Musician and Recording World as part of a Chase Musicians' multi-page promo that included a big push for the ARP Avatar. Unfortunately, as is often the case when converting a colour ad to black and white, the small photos really suffered and are barely recognizable. Boo. The final 2-page spread of that Chase multipage promo is a one-night-only event to promote the updated synthesizers at one of Chase's stores, including an incredible 20% discount on all orders taken that night. As well as free drinks - in brackets: non-alcoholic only. LOL! May have to scan that one at a later date. It's quite spectacular. Now, I just can't go any further without commenting on the ad's contents. Sure, its nicely designed with balance, good use of white space, yadda yadda yadda... but its the ad-copy itself that I find really really interesting. And I have to say that this time ARP definitely made their synths "easier and more expressive to play" with the new black and orange "Halloween" colour scheme. Although not everyone liked the new colours, it was definitely a lot easier to locate and comprehend controls for "quick, clear readings". There are a few other nice details in the ad-copy too. For example, ARP points out the synths' "extended keyboards" that "make them easier to play even when stacked with other keyboards". And, to subconsciously hit that point home, the centre photo of the Odyssey is lighted from above in such a way as to highlight the long keys of the keyboard. Brilliant. And finally, the last point in the ad makes me chuckle. ARP has "redesigned" the prices for the Odyssey and Axxe. I love little bits of historical reference material like price drops. And now I have to go find out just how much of a drop! And then, after that, get my synth advertising timeline tool updated. I'm falling behind on that too. Gah. 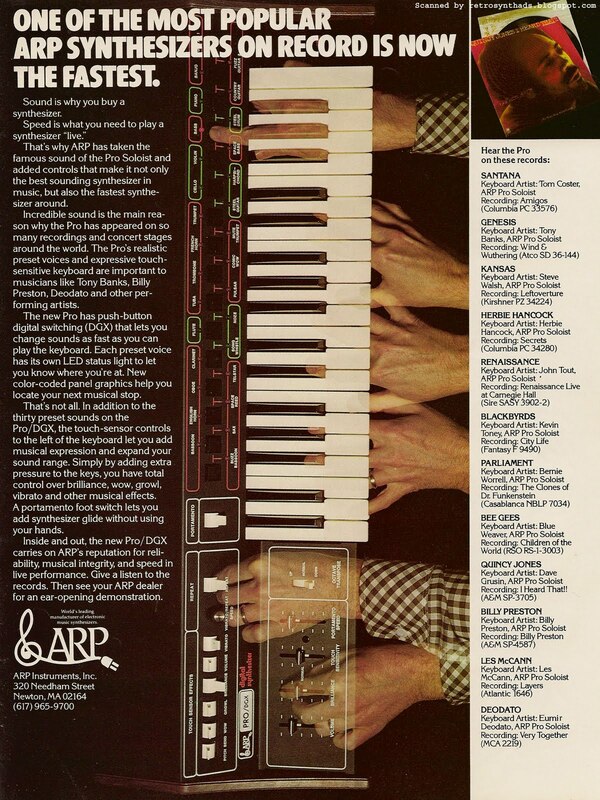 ARP Omni "...best selling synthesizer in music" full page black and white advertisement from the back inside cover of the November 1977 issue of Contemporary Keyboard. So my mood isn't so hot today. Maybe its the rain. Or the fact that this is the last day of a three-day-long weekend that has included exactly 6 hours and 13 minutes of excitement - two of those hours being the finale of Hell on Wheels last night. I've done none of the things I was looking forward to doing. No music production even though I just installed Sonar X2 and a few virtual toys to go along with it. No video game playing even though Skyrim is sitting on my Xbox still in the wrapper. Note to self - SNAP OUT OF IT. Got to enjoy my afternoon and evening before I start four long days of work-work again. My meh-ness also spills out into how I feel about this ad. But this new one pager ad isn't too hot. Pretty generic actually. 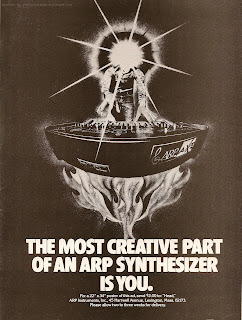 We got the endorsements, ad-copy full of blatant market-speak like "virtually unlimited" and "sizzling", and of course, ARP's very own "human engineered" line. And if this was 20 years later, I would also comment on the awful 15-second Photoshop fade effect used around the image. Ugh. This ad looks to have ran in November and December 1977 issues, as well as the January 1978 issue of CK. And sadly, the January ad would not just signal the end to this ad's short lifespan, but also the end of ARP's dominance of the inside back cover of the magazine. They started off getting that spot sporadically in 1976 and then continued to use it much more faithfully throughout 1977. Interestingly, this ad also popped up in International Musician and Recording World's January (UK)/February (International) 1978 issue. Primarily a UK magazine, it is a little surprising to see the *exact* same ad. they didn't change a thing. The US and Canadian addresses were retained. And even the price for the demo record was still one dollar, while every other ad in the magazine uses pounds. Even more odd, they didn't even resize the ad for IMRW's larger page format. So there is actually about an extra two inches of white space at the top. Awkward. So what about that claim - "best selling synthesizer in music"? Apparently ARP sold a lot of them. I mean - a lot. 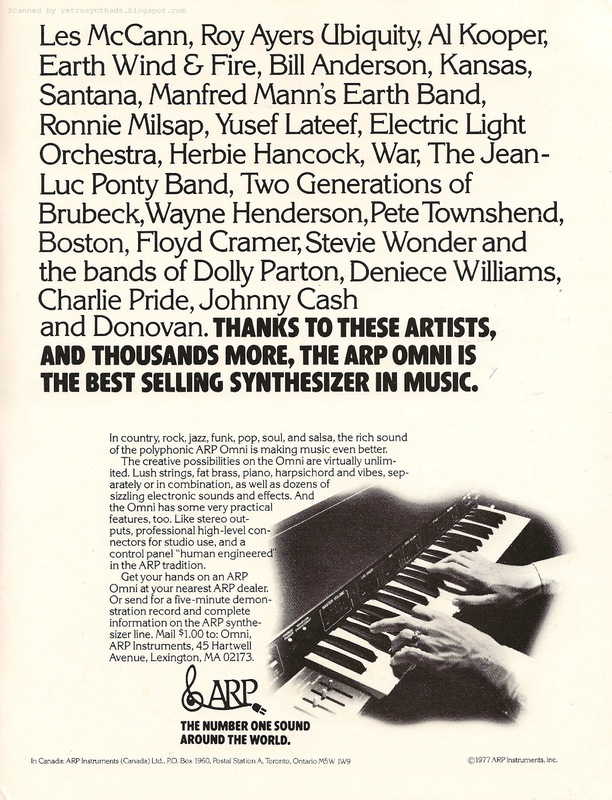 The Omni Wikipedia page says its "ranked as ARP's best selling keyboard" and "very popular in its time". But, the page is also flagged as not citing any references or sources. Synth Museum also makes this claim. As well as a wack of other sites. But again - no cited references from independent sources or even from interviews with ARP representatives. I'm gonna do a bit of digging in old interviews and articles and see what I can come up with. I only have about eight more hours of awake time in my long weekend, and like I promised, its time to snap out of it and change this mood. ARP Axxe "The most creative part of an ARP..." full page black and white advertisement from the inside back cover of the September 1977 issue of Contemporary Keyboard. 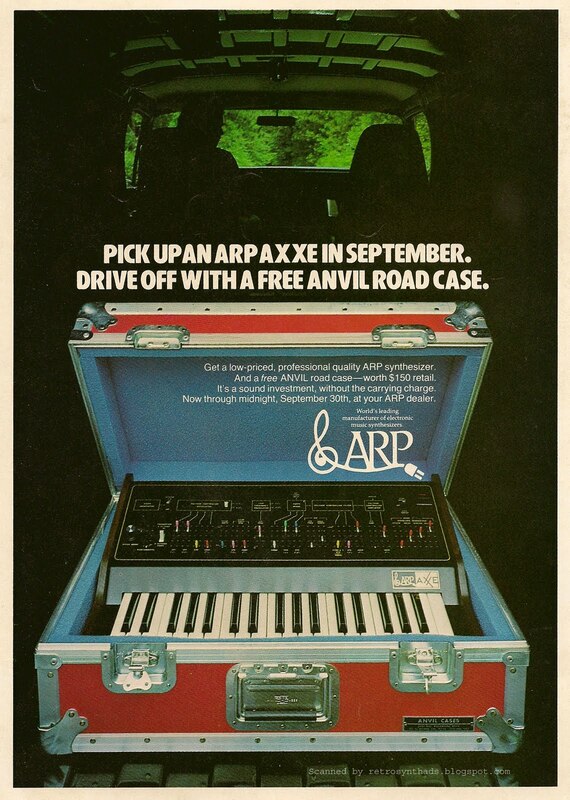 Seeing an ARP Axxe solo advertisement is about as rare as seeing me at a bar on country music appreciation night. Most of the time, the Axxe is walking in the shadow of it's big brother, the always more awesome and more popular ARP Odyssey. And in my mind at least, this was always the poor Axxe's fate in life. 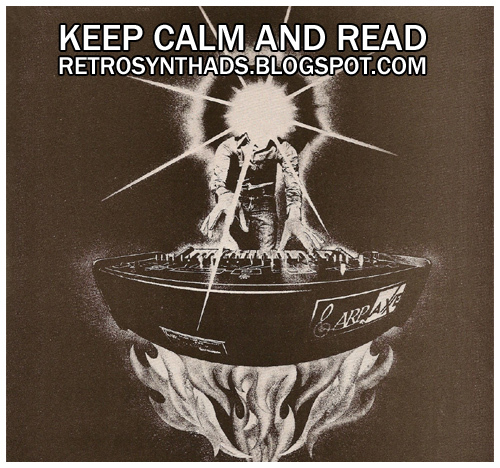 This Omni solo advertisement only seems to have appeared in the September and October 1977 issues of CK. And off the top of my head, I can only remember the ARP Axxe appearing on its own once before, in the October 1976 issue of CK (see right). And even it that ad, it's like it wasn't good enough to be on its own, and the Axxe's parents had to pay the kid next door to come over and play. Only in this case, the kid is a free anvil road case. 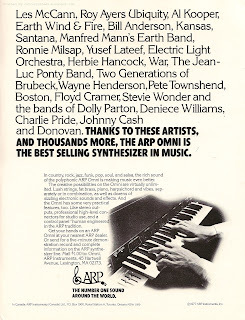 To nail the point home, I'd like to point out that this wasn't the only ARP ad in the September 1977 issue of CK. 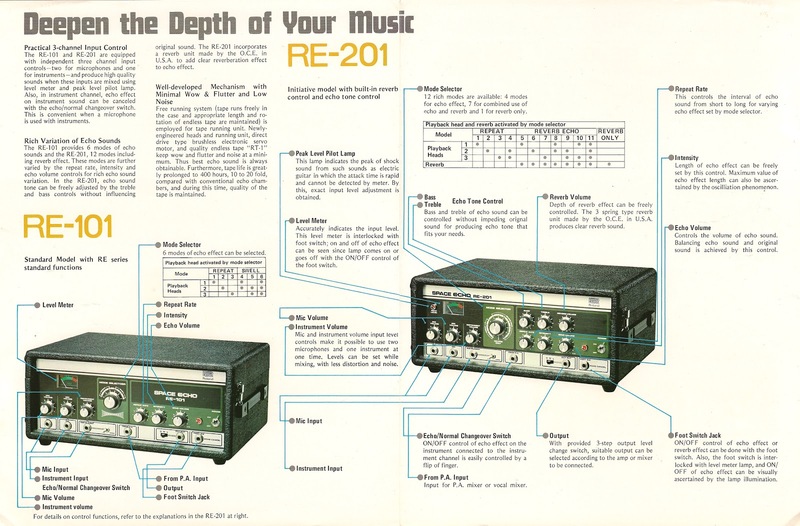 There was also this "Proportional Pitch Control" two-pager that featured - you guessed it, the Axxe AND Odyssey. It also had to share real estate with other ARP instruments in the earlier "Gold Records" family portrait and "A few facts" attack ad from 1976. It's hard to be an ARP Axxe sometimes. It really is. Compare that with the Moog Minimoog's siblings - Rogue, Prodigy, etc. In my mind I consider them all different instruments with their own individual personalities. They were all different enough to keep separated in my head. "Fact 2: Learn to play one ARP and you can play them all. If you learn to play ARP's funky Axxe, you're halfway to learning the big 2600. We wrote the book about each. ARP didn't become the world's leading synthesizer manufacturer by accident. No way. We got to the top by carefully designing a family of synthesizers that let a musician transfer techniques from one ARP to another. If you learn to play an ARP Axxe, you can play an Odyssey or ARP 2600 with ease. The terminology is the same. The controls and front panel are the same. Only the features and sound possibilities are expanded." This deliberate attempt by ARP to make all their synthesizers so similar definitely has its positive points. But one negative is that it gets harder to psychologically separate them in your customer's brain. I might go as far as to say that this would affect my buying behaviour. 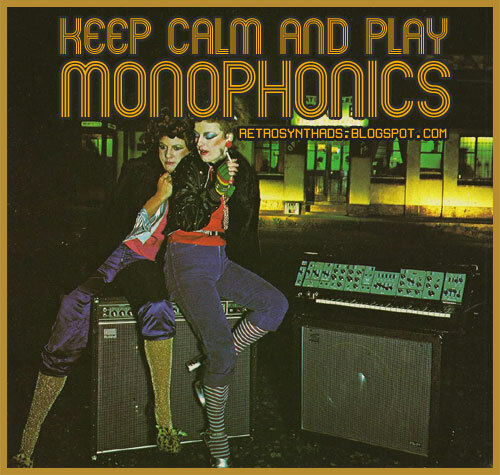 If I already had a Minimoog and wanted to expand my sound capabilities, I wouldn't hesitate to buy another Moog - say a Rogue or Prodigy, because in my mind they are different enough. But if I have an Odyssey, I probably wouldn't purchase an Axxe because in my mind ARP has built them up to look and sound too similarly. ARP probably would have lost my repeat business. Anyways, all that aside, this is a pretty nice lookin' ad. All pre-Photoshop too. ARP obviously thought the imagery was nice too. Nice enough that this ad's existence only seems to be for one purpose - to sell $2 posters of the exact same image. Like, instead of using the space to sell $1000+ synths. Yeah yeah, I know, posters in the 70s are kinda like those "KEEP CALM..." viral images. They are seen by plenty once you put them up in your home, studio or music store. But still, its hard to believe that ARP spent the cash for an inside-back cover ad all for the purpose of selling posters. 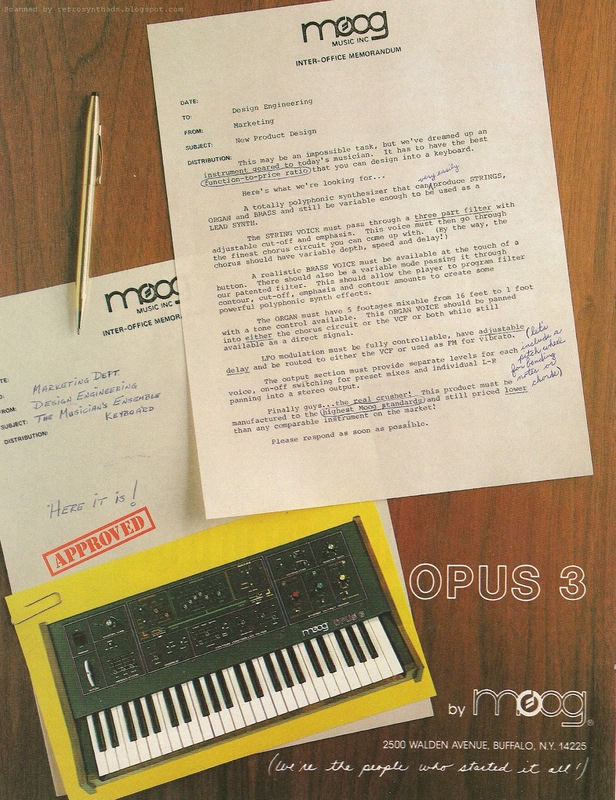 Moog Opus 3 "Inter-office memo" full page colour advertisement from page 66 in the November 1979 issue of Contemporary Keyboard Magazine. Honestly, a little surprised to see Moog using a gimmick like this in it's ads. Its not necessarily a bad thing. Just not really a Moog thing. But most people I talk with like this advertisement, and more importantly, respond to it with a little chuckle, so who am I to judge. The premise is that the Marketing department has come up with an idea for a new instrument. They write a memo to the Design Engineering department, who then come up with the finished product, and write a memo back. So, really, no matter who you are, you will enjoy the ad. There is actually a fair bit of ad copy to read, but for those lazy readers, Moog uses the idea of proof-reading as a way to highlight all of the most important features. Okay, now that I've thought through it all... changing my mind. This ad is *genius*. There is another reason to love this ad that is not readily apparent. The first time it ran, it was placed right across the page from this Moog Prodigy "Synth heard around the word" ad. That's right - a Moog 1-2 punch. Kapow! "Moog keyboard. The Opus 3 is a 49-note keyboard instrument that creates string, brass, and organ sounds. The string voice has a separate equalization section consisting of a 3-mode filter with variable cutoff frequency and Q. The organ voice has five mixable footage stops and a tone control. The brass voice is switchable over a three-octave range (16', 8', 4'). The string and organ voices may be routed trough a chorus circuit with adjustable depth, speed and delay. The organ and brass voices may also be routed through a VCF. Also included is an articulation mode switch which provides either a cancelling mode, which retriggers new notes and cancels sustaining tones, or an overlap mode, where notes with long release times continue to sound regardless of any additional notes played. This enables the user to create layered sound regardless of any additional notes played. This enables the user to create layered sound with brass and strings retaining independent articulation. LFO modulation can be routed to either the tone generators of the VCF to produce vibrato of wah-wah-like effects. The modulation speed is indicated by a blinking LED. A pitch-bend wheel is also provided. The unit measures 29 3/4" (75.5cm) wide, 5 3/8" (14.6 cm) high, and 15" (38.1 cm) deep. It weights 20 pounds (9 kg). Price is $1,195.00. Moog Music, 2500 Walden Ave., Buffalo, NY 14225." 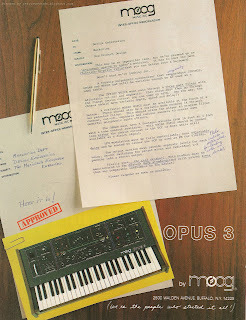 I couldn't find a lot more info on the Opus 3 in CK after early 1980, until the January 1983 issue of CK when the synth pops up in a Keyboard contest. That's three years later! Not too shabby, really. The Opus 3 had a pretty good life.